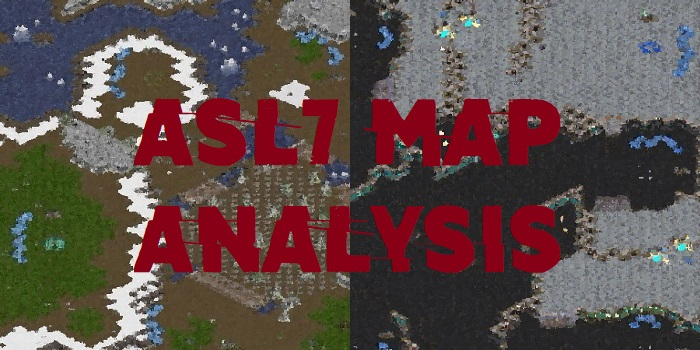 Another season of ASL greets us with two brand new maps to be tested in the arena. Ty2 will be providing a map analysis of what will soon be the wartorn battlefields this coming weekend. This season's maps, Block Chain and Whiteout, hold the same familiar sense of ambition from last season but with a few fresh subtle changes to create intriguingly different games. The main feature of Block Chain, a 4 player map, are the pathways connecting main bases and naturals to other main bases and naturals. Each pathway is blocked by a pair of assimilators with two neutral Zerg eggs that need to be destroyed before units can pass. Large units (e.g. Tanks, Dragoons) by default can pass between the assimilators. If one assimilator is destroyed, only small units (e.g. Marines, Zerglings, Zealots) can pass. If both assimilators are destroyed, no units, except the ghost, can pass. Mineral patches for workers to walk past Zerg eggs are present on one side of assimilators going outwards of main bases, which makes scout denial far easier. There is a 1/3rd chance a base is adjacent to the opponent’s natural or main. In the case of connecting to the main, killing the blocking zerg eggs can force static defence on two fronts. A recycled concept of maps such as Outsider and Gold Rush begs the question of how Block Chain distinguishes itself. Block Chain's lack of center bases, and straightforward, square layout, creates more rigid avenues of attacking and expanding. Less flexible, and far more focused on establishing these spread-out few bases makes the game more conservative and resource oriented. In a longer game, players will either seek to break stalemates and apply pressure on the bases or simply rely on short term heavy pressure. To begin, Block Chain is well favored for Terran. The large ground and air spaces are good for dropships, and the fewer bases make Terran stronger in cost effectiveness. Along with a better developed 1-1-1 (Factory and Starport expand opener), Terran will be a force to be reckoned with. The first main concern of maps is how good they are for 8-rax. Currently, all bases are wallable at their naturals, and the barracks can be built anywhere up to and around the middle of the map. This is a strong opener for Terran, but due being a 4 player map, a diagonal spawn seriously hurts its effectiveness. Like Gold Rush, unique opportunities for a fast 3rd base using the 3rd hatchery are open. However, with the increased occurrence and risk of factory openings and all of its dropship and wraith derivatives, this possibility is less likely. Still, opportunities of going Crazy Zerg, a strategy where Zergs go straight to ultras from mutalisks, is still possible. The closer gas bases are insulated by common marine/medic attacks and therefore also a natural expansion choice. A Zerg need only to sunken the natural and to focus the rest of their resources on stopping dropships. Speaking of drops, the map has generous spans of ground and air space for dropships to abuse, which makes intercepting drops with scourge harder. Ability to pressure Zerg at multiple points while still having mobility to defend their own bases supports the SK style. Arriving to SK Terran will not however involve the typical +1 5-rax. Like Gold Rush, Terrans can't apply pressure to the third like they used to if Zergs take the closer thirds in between main and natural bases. More fast tech builds with faster starport tech, or—most likely—the coveted 1-1-1 will be the prime choices. Terrans probably have the toughest matchup out of all races. Considering the only option for thirds are the isolated assimilator bases, Terran can be picked apart by shuttles. Seeing as speed shuttles are already a popular choice, there's even fewer reasons for Terran to attempt getting a third. They are further prone to having their base attacked from two places - their natural, and the assimilator path. We've already seen protosses abuse the egg pathway forcing Terran to make two bunkers. Again, another advantage of an already difficult map for Terran to play on. What's more, a single recall, or Carriers which can abuse the air space above the assimilator bases can wreak havoc. We've seen some dropship builds into 2 base all-in pushes, but we're going to have to see more variety and consistent play out of Terran to hold their own. The assimilator bases also present ample proxy locations. However, straightforward mass gateway and other related proxies probably make the strategies too predictable for the live stage. If Protoss were at the mercy of Zerg on even the most relatively tame of maps, they're in serious trouble on Block Chain. Zerg has several threatening strategies, most prominently the turtle zerg style. Commonly seen by Larva, Zergs can secure an easy fifth by first securing a far natural third, and main base fourth. Then, Zerg can safely secure the base in between the claimed main bases. Such a greedy play strongly urges Protoss to put pressure on Zerg, but also given the fewer bases of the map, can conversely play into Protoss hands in a resource starving scenario in the late game. Another threat are muta scourge compositions which can take advantage of the isolated midpoint bases. As a precaution, and as a means to initiate their own drop harass, Protoss will mass corsair. The next pressing concern for Protoss is expanding to a fourth. Undoubtedly, they'll either have to settle with a natural base adjacent to the close third they've taken or—even riskier—another third. The bases are vulnerable to being broken into via the assimilator paths, but besides that, the bases are fairly secure. In addition, there's potential for corsair/reaver play. However, even when maps appear promising for such dreamy strategies, players still stick to standard play. Due to bases being spread out from each other, they’re harder to defend. That may be the factor that finally pushes Protoss to finally go corsair reaver. While Zerg is quite strong, there are still tools on the map to make Protoss more than capable of winning. We'll also likely see a resurgence in the turtle zerg style on this map. Overall, there aren't too many surprises when it comes to Block Chain, and it leaves more to desire as a slightly more generic Gold Rush. It follows the commonly held trend of T > Z > P > T. Still, it'll be interesting to see how inventive players are to work around their respective matchup disadvantages. The second map of ASL 7 is a special treat which features the heavy use of vision blockers not seen since the antiquated KeSpa map, Demon's Forest. By far the more exciting and fresher of the two, there's a lot of potential for Whiteout to produce some amazing games. The entirety of major army movement will take place along the black areas unaffected by the vision blockers. This will stay true mostly for Terran. Air units, like observers, mutas, science vessels, and overlords will act as necessary spotters. The vision blockers furthermore can act as places to hide units, especially for cheeses. In larger engagements, they can simply be used for space to spread units out for a surround. I'm getting a general sense that air units, like carriers, mutas, dropships, and more, are meant to be encouraged and played on the map. Terran will have to adjust the most and rely on comsat scans to make up for lack of air units. Also, as a 3 player map, there are significant positional disadvantages usually, but similar to Sylphid, that problem is partially remedied by equally distant center bases as ample third bases. However, the bottom right is noticeably imbalanced, the natural base not pressed against a wall unlike the other two bases. That requires more defense versus mutalisks, especially in TvZ. Outlying bases, right next to main bases, and the adjacent base are noticeably susceptible to close air rush distances from adjacent main bases. The most promising map out of ASL so far, Whiteout exhibits both originality and sensible, yet riveting design. Expect to see great use of air units, harass, and tactical use of the vision blockers for the most unique games ASL may produce yet. (Ive added a link to this article from the other map thread). Note "BlockChain" got updated in the last few days to 1.1 and Whiteout is also on version 1.1 currently. Thanks for the write-up. Whiteout is an interesting map. I really like the idea of vision blockers. Blockchain looks scary for Terrans against Protoss. I foresee many carrier-based wins for Protoss in the future. I really wanted to love both these maps but they each feel like tons of space is wasted. Wtf is with the ursadon zoo on blockchain? So irrelevant to competitive play. Whiteout the blocked cliffs on the natural ramp sides Effectively increase natural to third travel time time to unnessecary levels. I liked the vision but the Korean mappers laid an egg a bit with these two. Sylphid has many issues too like the lack of high ground third and lurker egg at choke that make the map feel shallow and artificial. I give them all no better than 4/10. I've only seen a handful of games on blockchain so far but it seems so hard for the slower race to take a 3rd. I've seen multiple games where the T opted to take the middle base instead of trying to get a side expo. TvZ seems really fun to watch on it, but tvp seems hard AF. Probably the worst TvP map I've seen since third world? The games have been fun to watch none the less, hopefully Ts figure out a way to pull through with a couple tvp wins on it.